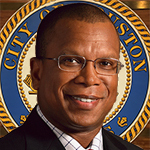 April 5, 2016 -- Mayor Sylvester Turner has announced his selection of Ronald C. Lewis as the new city attorney. Like the mayor, Lewis is Harvard educated and has run his own law firm. Before co-founding Marshall & Lewis LLP in 2006, Lewis was a partner at Baker Botts LLP, which he joined right after graduating from Harvard with honors in 1983. He is a trial lawyer with more than 30 years of experience handling complex cases for businesses and individuals in the energy, real estate, construction, financial and manufacturing industries. He is a member of the State Bar of Texas and the Houston Bar Association as well as a Life Fellow at the Houston Bar Foundation, where he was chairman of the board in 2000. His undergraduate degree is from the Woodrow Wilson School of Public and International Affairs at Princeton University. “I look forward to serving the people of Houston, their elected officials and city employees,” said Lewis. Lewis’ professional affiliations include the Best Lawyers in America, the American Law Institute, and The International Association of Defense Lawyers. In addition, he has served as a member of the Houston Bar Association Minority Opportunities in the Legal Profession Committee, as a steering committee member for the State Bar of Texas Minority Counsel Program and on the Commission for Lawyer Discipline. He volunteers for the Center for Public Policy Priorities and has previously served as a member of the University of Texas MD Anderson Cancer Center Board of Visitors, the South Texas College of Law Board of Trustees, Texas Appleseed, Neighborhood Centers Inc., and Junior Achievement of Southeast Texas. Lewis was selected after a competitive search coordinated by a panel comprised of local lawyers. There were about 30 applicants who went through the selection process. Houston City Council is expected to be asked to confirm Lewis’ appointment in two weeks. He will start work May 2, 2016 and is replacing retiring City Attorney Donna Edmundson, who has agreed to stay through the end of May to help with the transition.